Arduino Vibration Switch Module KY-002 Keyes allows detection of shock and vibration. The KY-002 Vibration Switch Module consists of a conductive vibration spring and a 10k resistor, it will react to shock and vibration by closing the circuit. Connect the Power line (middle) and ground (-) to +5 and GND respectively. 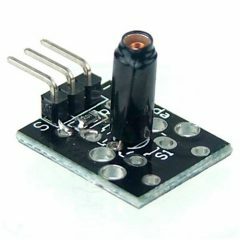 Connect signal (S) to pin 3 on the Arduino. The following Arduino sketch produces a shock flasher. Pin 13 (LED) on the Arduino will flash when KY-002 detects movement. Pin 3 is used as input from KY-002. Fritzing Part: KY-002 Vibration Switch Module. Hi, first of all, I wanted to thank you for sharing this great site with us. Especially the Fritzing vectors and diagrams.